Dream your best life! DreamCloud’s Cashmere cover provides unmatched breathability, premium softness and is naturally resistant to bedbugs. Don’t just go to sleep, go to DreamCloud. DreamCloud’s High density foundation foam keeps your back in alignment and cradles you no matter what sleep position you prefer. Is DreamCloud the right bed for you? The DreamCloud mattress model is recommended by 80% of owners on GoodBed (based on 25 ratings + 9 reviews). 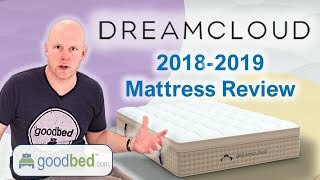 Do you have a DreamCloud mattress? Write a Review! Have a question about the DreamCloud? The DreamCloud is a euro top spring core medium-firm mattress model released in 2017 that is manufactured by DreamCloud. DreamCloud mattresses sold by DreamCloud come with a 365-night in-home trial. DreamCloud provides you with a full year, 365 nights, to enjoy DreamCloud and decide if DreamCloud is right for you. If you decide for any reason that DreamCloud is not your ideal mattress, we’ll remove the mattress from your home and refund your payment. DreamCloud mattresses are only available online.